[Javier] must have an awesome academic adviser. For his master’s thesis, he turned a building into a Rubik’s cube. 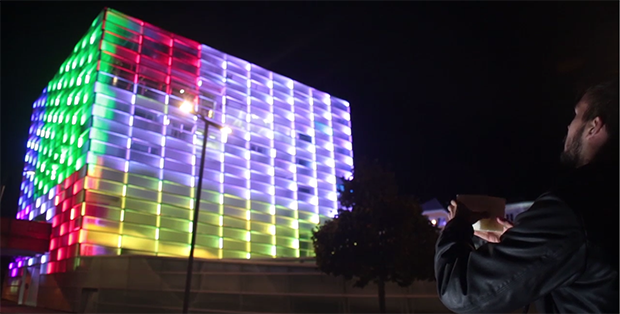 The Ars Electronic Center in Linz, Austria, is a building with a whole bunch of colored, programmable lights on the facade. [Javier] thought this would make for an excellent Rubik’s cube, and set to work convincing his thesis advisers this idea was possible, and building the hardware and software. Since only two sides of the building are visible at any one time, [Javier] needed to build a controller for this project. The solution was to build a normal Rubik’s cube and stuff a microcontroller and a FreeIMU in the center. This setup senses the twists and turns of the Rubik’s cube, as well as it’s position in space, effectively creating an interface between the hand and a giant light-covered building. The Rubik’s cube interface connects to a computer running an app written in openFrameworks. By sensing the direction the cube is oriented, it can automatically display the two sides of the cube facing the user. There’s a great video showing just how this building-sized Rubik’s cube works. You can check that out below. So, he basically paid $120,000 to do this? Rather disturbing to think I have been working 60-80 hours a week since 2002 just for the opportunity to do the same thing. I’m almost able to apply, so the nightmare will be ending one way or another. Paying top dollar for further education is one of the few things we Europeans did not import from America. This is amazing! In the old days you’ed have to turn the building by hand. This got a whole lot less impressive when it turned out the building & software controlled LEDs were there already – it boils down to “man writes rubik’s cube program”.